I used to own a house on Madison's East side. I owned it for about three years, where I dabbled in vegetable gardening, planting basil and tomatoes and starting a compost bin. And then I sold the house in October 2008. All that work building beds and soil was left behind. In fact, the woman who bought my house marveled at the late-season basil and eggplant she harvest from the garden. In 2009-10 we put Jay's house up for sale, and we did minimal gardening, just enough to keep the yard presentable during showings. Last summer, following 18 months, 76 showings and one offer that fell through, we took the house off the market. Then this spring I got the gardening bug. I rebuilt and enlarged the herb garden, made a raised bed along the garage and started seedlings in the basement. And we started to talk about selling the house again, and my enthusiasm to garden took a nose dive. And then I got an e-mail that changed everything, my employer announced the start of a community garden right where I worked. Jay and I talked about getting one of the plots, I made plans, and we built a 10x10 raised garden bed (see previous post for a description and video). Even though we are still thinking about selling the house, things will be different. This time, no matter when we sell, we will still be able to harvest from our five eggplant, six tomato, six pepper, eight brussel sprout and dozen leek plants. All of this work is ours to keep as long as I’m employed at American Family. Which is how I explain to myself a recent and very urgent need to finish what Jay and I started. 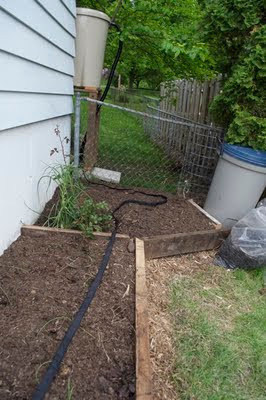 When we built the garden bed at the end of May, we reinforced the interior “keyhole” access with 2x6 oak planks my dad gave us, and let the soil slope down toward our neighbors on the edges. 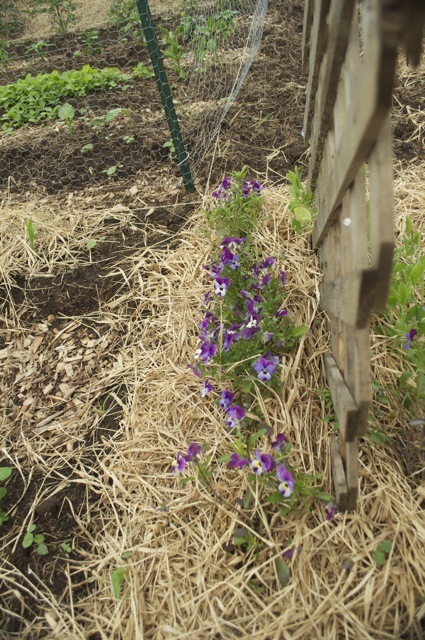 The raised bed with reinforced walls on the interior, but soil sloping down toward the outside edges. Last weekend my dad gave me four more 10-foot planks and this week before work, I measured, cut and installed the exterior reinforcing. The raised bed garden is done, I’m very happy with it, and no matter what happens to our house this summer, the veggies are coming with us. The exterior is now reinforced with 2x6 oak planks, defining the 10x10 plot, keeping our fertile compost in the garden and keeping neighboring weeds out. With a garden shears and garland of ivy, gardeners, executives and a few curious employees officially opened the American Family community garden, located at the company's national headquarters on Madison's far east side. It was an overcast day, but dry and comfortable, a great day to see what the gardeners have been up to since the first day we could get in on June 3. The community garden is an easy walk from the main buildings, so many people ambled over for the lunch hour ceremony. 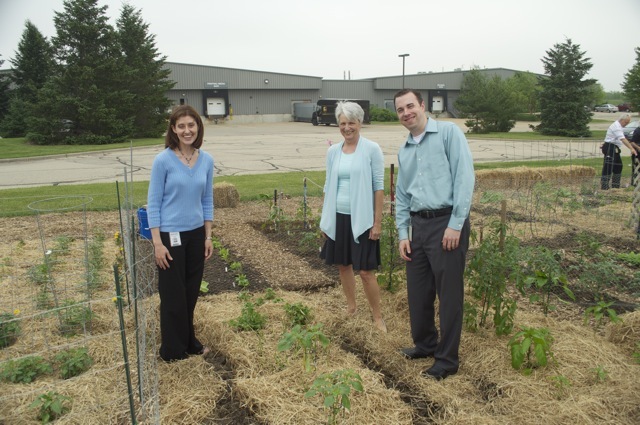 Angela Freedman and Leanne Glover, who are the main brains behind the project, explained that the garden is both part of the company's commitment to sustainability as well as each of their capstone project for an Edgewood College sustainability certificate. 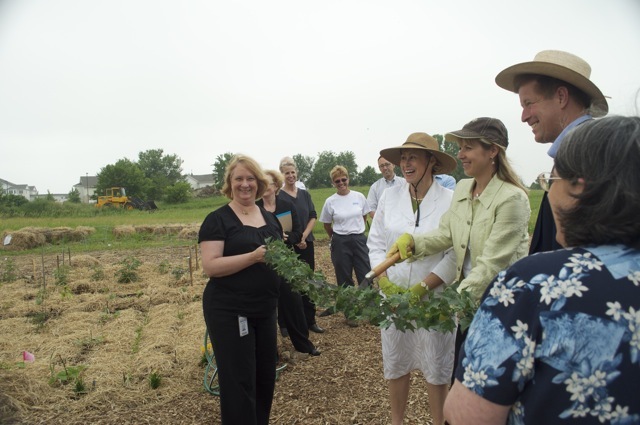 Mary Schmoeger, a company executive, shared her commitment to the project, and together with two other vice presidents, cut a ceremonial ivy, and people wandered throughout the beautiful and unique 10x10 plots. Thinking not only of bounty, but of beauty, many gardeners planted flowers among veggies. A few of the fruit trees on the west side of the community garden. 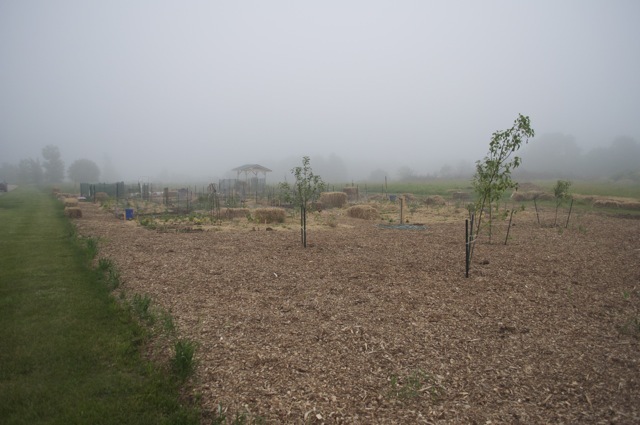 In a few years, gardeners will be able to harvest from the small orchard. 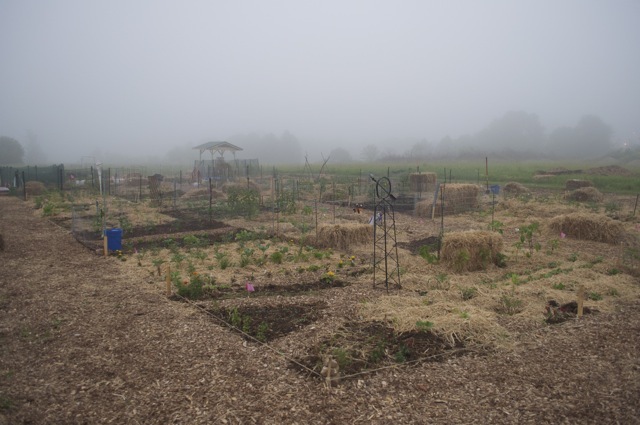 The garden on Monday morning, the background shrouded in fog. A very peaceful place at 6 a.m. In the sustainability cycle, reuse comes before recycle, these hockey sticks make great stakes. 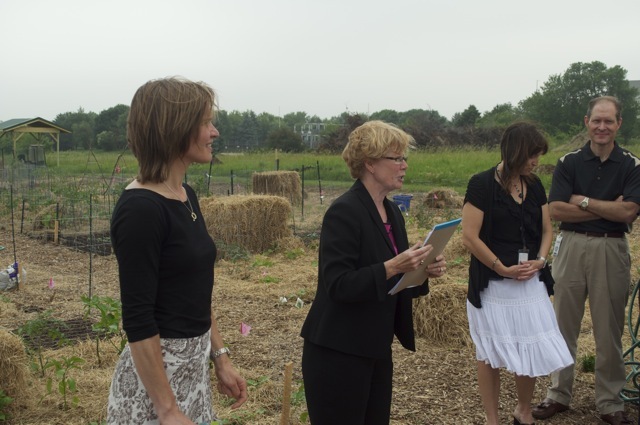 Angela Freedman (left) and Leanne Glover (center) talk about the community garden both as part of American Family's commitment to sustainability and the capstone for their sustainability certificate program. 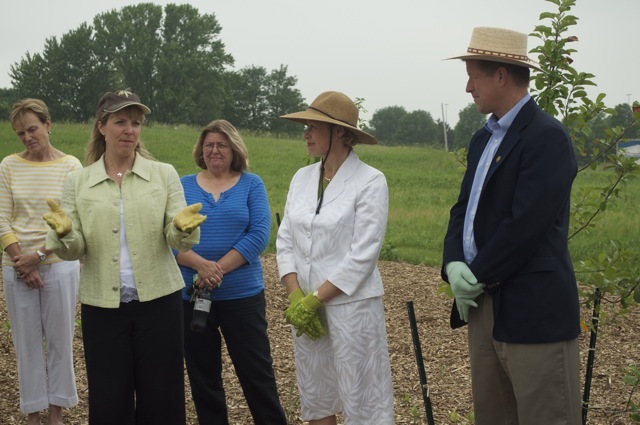 Mary Schmoeger, second from left, Annette Knapstein (in white) and Dan Kelly, right, are American Family executives who sponsored the community garden project. Ivy cutting with a garden shears. 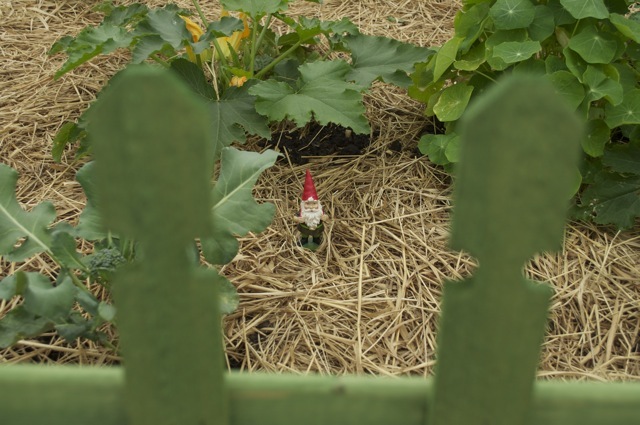 Gnomeo waiting behind a picket fence for Juliette. 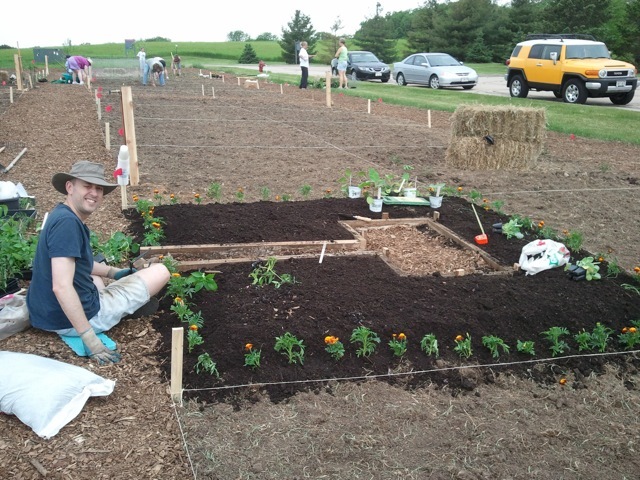 A garden with a mission, these folks planted with one thing in mind; salsa! 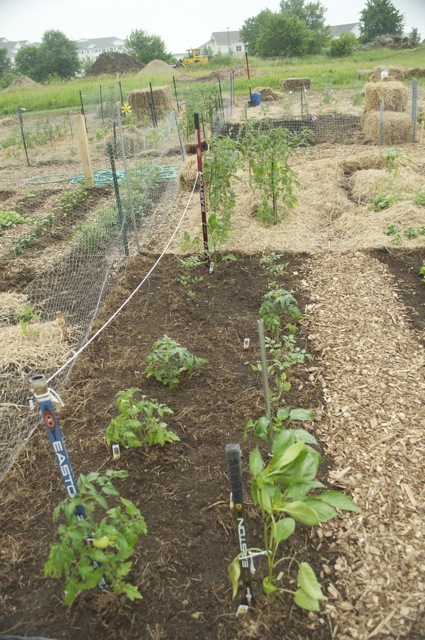 Pictured are tomatoes, peppers, onions and cilantro. 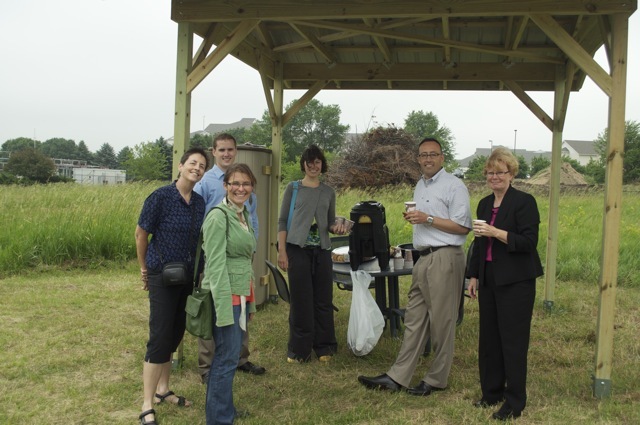 Cookies and lemonade under the community shelter. Some folks have their lunch at the picnic table. My plot, tomatoes now have tar paper shelters and the brussel sprouts (left corner) really jumped up in the last few days. to supplement grocery store vegetables from the garden. This type of garden could easily be accomplished in containers or a small plot of sunny dirt and include a few of the gardener's favorite vegetables; perhaps a Topsy Turvey tomato plant or patio cherry tomatoes, maybe a small herb garden in a planter. small space gardening. 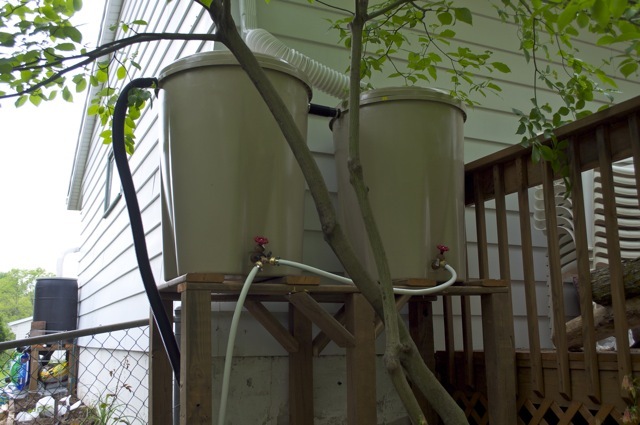 If you have limited space, this will dictate what you can grow. Many vegetables grow well in containers, while others require dirt but are ok in small spaces. The one thing to remember here is that spreading plants such as squashes, pumpkins and cucumbers (unless you train them to climb) won't do well in small spaces. to be the major vegetable source over the summer. This garden would not necessarily require huge volume but greater variety than a supplemental garden. 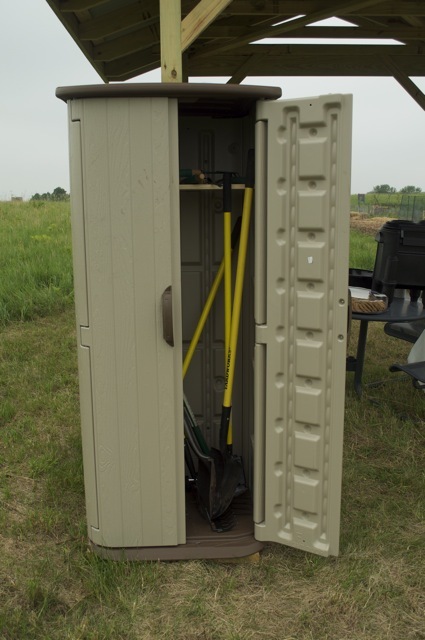 It would most likely need to be in the dirt versus container gardening, and would require some planning and good timing so that food could be harvested in the spring, thoroughout the summer and into early fall. This kind of garden could include early, mid-summer and late-summer/autumn bearing vegetables, and could also include herbs such as basil, dill, chives, oregano, and other favorites, many of which will winter over if properly prepared in the autumn. for preservation such as canning or freezing. 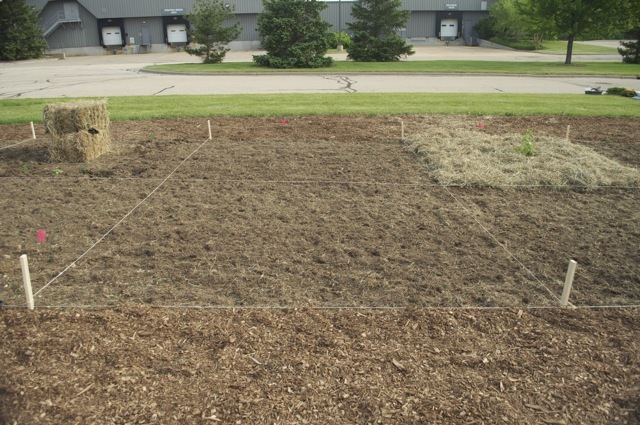 This type of garden has production in mind, and will likely have lots of a few vegetables. Favorite canning vegetables are tomatoes (stewed, or as soups and sauces); pickled beans, candied beets, pickles. Good freezing candidates are broccoli, spinach, corn (if you are lucky enough to have the space), brussel sprouts, etc. There are books and online references for all of these preserving methods. for long-term winter storage. Some vegetables do not need to be consumed or preserved immediately. These tend to be the later-arriving vegetables such as onions, garlic, potatoes and hard squashes. One woman from Troy Gardens told us that her goal is to grow so much garlic and onions so she has enough until the next season's crop is harvested. For her family of two, that meant several hundred garlic plants, and another several hundred onion plants. This is a great idea if you have lots of garden space, and somewhere to store the vegetables. What's the mission of your garden? Please leave a comment, we'd all like to know what inspires you to get into your garden. Thanks to dry weather, a tripod and my Nikon D5000, I was able to squeeze 5 hours of work into a 2:30-minute video of Jay and I building, preparing and planting our 10x10 community garden. 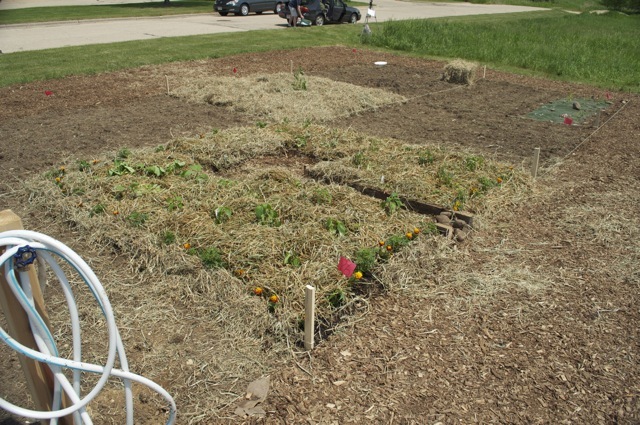 Hats off to John Denver for the perfect song, and to American Family for making the garden possible. It's in my genes; or at least it was a learned gift from my mom when she sarted gardening the summer after our November 1976 move to our family farm. It's sustainable; growing my own food reduces the carbon footprint my food requires to get from source to my table. The community garden at work adds to the sustainability, I drive to work anyway, so there is no extra driving to access the garden before or after work. It's possible; we have some sunny south-facing spots at home, and the community garden at work, while small, has 180 degree access to all-day sun. It's trendy; pick up any newspaper or magazine and you can read about the "local food movement," reducing the carbon footprint of food, people raising chickens in their back yards, etc. 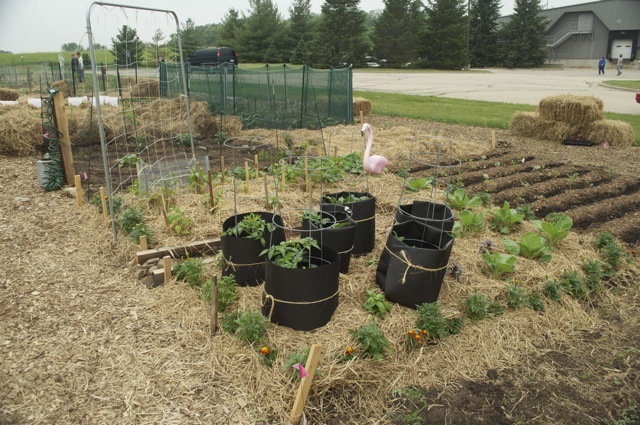 I think we have a certain vibe here in Madison that encourages it as well; the city composts leaves that we can buy cheap, city dwellers are allowed to raise three hens and there are community gardens everywhere. Why do you garden? Please leave a comment, we'd all like to know what inspires you to get into your garden. 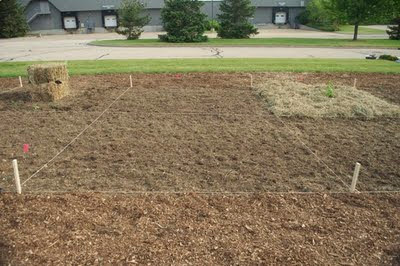 On Friday afternoon, June 3, the American Family community garden opened for planting. Jay and I got out there on Saturday morning. In the weeks leading up to opening day, I planned, started seeds, collected materials, asked lots of questions and sketched several ideas to make the most of the 10x10-foot plot. 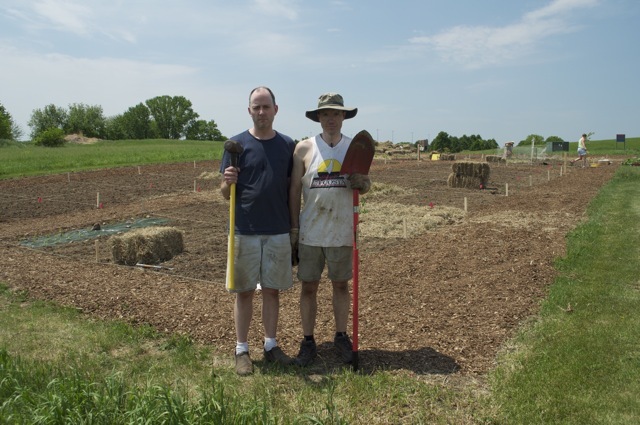 Watch a video of Jay and I building our community garden plot. 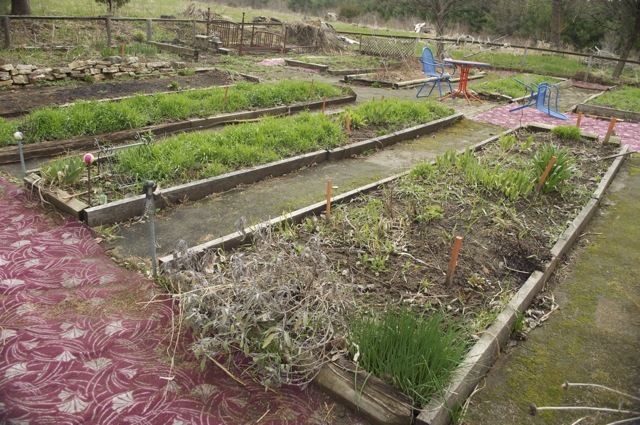 The community garden plot before we started to work in it. The soil had been tilled three times, though not very deep at all. The ease of access, fertility and loose soil of raised beds are so perfect for gardening that naturally I envisioned building raised beds, even in the tiny community garden plot. 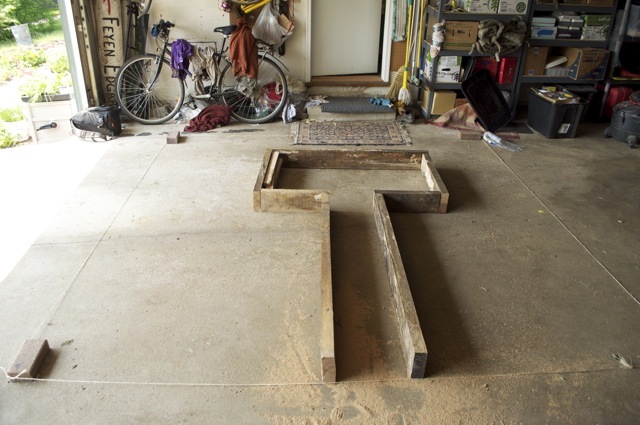 I sketched out two 3 1/2-foot beds with three 1-foot rows, one down the middle and two down the sides for full access. Then I did the math - that design dedicated 30 square feet to non-productive paths (1-foot x 10 feet x 3 paths). There had to be a better design. 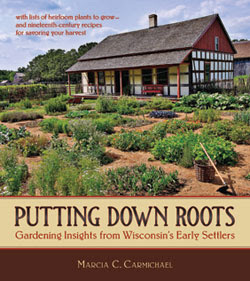 I grew up with raised beds; my mom's garden is made up of eight 3-foot by 20-foot beds she has been cultivating for more than 35 years. I learned early on that once the plants go in no one, not even mom, steps into the beds. I next divided the 10x10 plot into quadrants with 1-foot paths down the middle of each axis. This design involved a bit more stretching but only dedicated 20 square feet to paths (1-foot x 10 feet x 2 paths). I still wasn't happy with paths that occupied 20 percent of the bed. The final design with a path from the main garden aisle (bottom of photo) that lead to a small inner rectangle allowing access (a bit of a stretch to the far corners) to the entire bed. The paths only occupied 15 square feet of the 100 square feet of bed. I wanted to create reinforced raised beds, but didn't have enough lumber to do completely surround the bed. So I have a hybrid of reinforced raised beds in the center so soil doesn't fall into the path access area, and unreinforced on the outside, sloping down to my three adjacent neighbors. This autumn, after the beds are cleared out, I plan to add structure to the outside so the compost can be full depth all the way to the edges of the plot. We brought in 30 bags of compost ($6 from the Dane County compost site 11 minutes away). 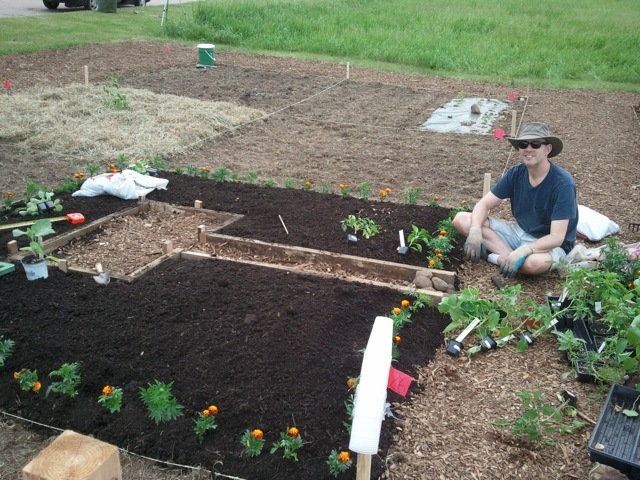 Here Jay is planting a perimeter of marigolds to keep out rabbits and beautify the bed. At the time, we had the only raised bed in the garden. We started to feel a bit awkward, as Jay put it, building Trump Tower in the middle of the prairie. 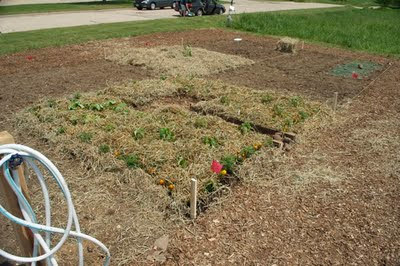 The bed mulched with marsh hay ($3/bale) from a local farmer who delivered a huge load of hay to the garden. Delivery was much more sustainable than all of us making individual trips to local garden centers to bring back hay for mulch. 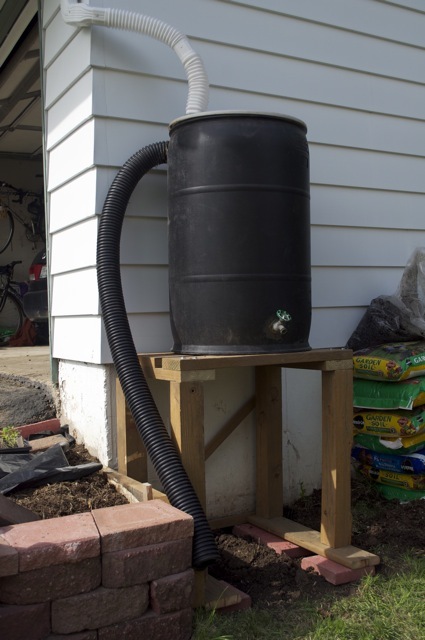 Here's the rain barrel wrap-up with a few photos. 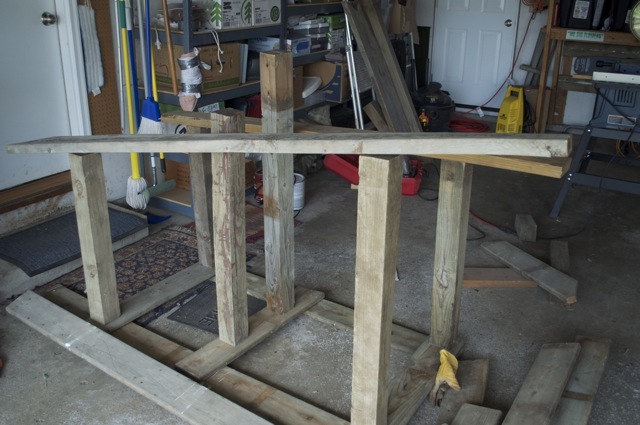 Jay and I spent a morning building stands for the barrels (a single-barrel and a double-barrel!). I was quite proud that the only money I put into the stands was the fasteners (screws, nuts and bolts). All the treated wood (4x4s, deck boards and even a few 2x6s) were left over from a deck project way before Jay got here, and stored in the rafters of the garage. I took them down, protected them with leftover deck stain and built stands to dimensions of the available wood. Mocking up the stand with available wood. Initial barrel placement to see how it fit with the rest of the bed at right. 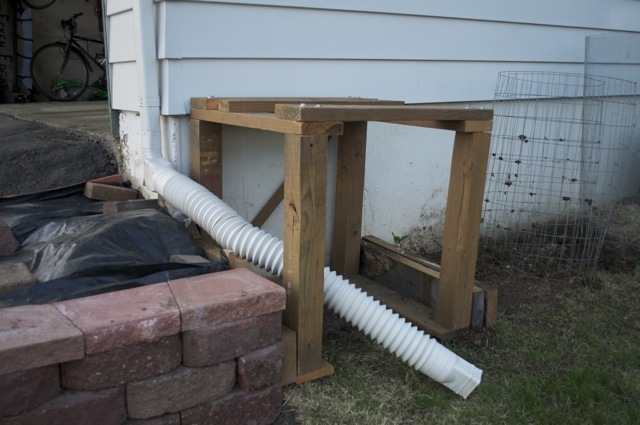 My goal is to use the single barrel to water the very nearby herb garden, and the double barrel to water the much larger beds along the garage (lettuce, radish and more basil and cilantro, nasturtium and a few zinnias and cosmos that are going to hate the partial shade. Single barrel from a friend, used to water the herb bed at left. We then installed the barrels on some paving bricks that previous owners had left in the basement. The two barrels bough at the City of Madison sale. The left gets water first via the white flexible gutter, and then overflows via the black pipe between. The left barrel overflows onto the ground. The white hose at bottom is supposed to even the water between barrels, have yet to get enough water to see if this is plumbing magic or not. I wanted to "hide" the two barrels as much as possible. This is the view of them from the street. My original idea was to use a soaker hose to water the beds; I quickly discovered it needed a lot of water pressure to work, very low water pressure out of these barrels even up on 30-inch stands.